This sink from Sinkology adds a nice touch of elegance to any bathroom. Manufactured using high quality copper, it can withstand all kinds of everyday wear without losing its stylish appearance. When it comes to improving the overall look and utility of your bathroom, this sink is a top-grade choice. From the expert craftsmen at Kraus, this vessel sink combines timeless style and modern efficiency into an elegant unit. Its tough glass design can withstand years of everyday use, maintaining a stylish appearance. Perfect for all kinds of bathroom styles, this sink is fantastic choice for your next home improvement project. The Kelvin copper sink defines luxury and functionality. This drop in copper sink has 4 inch faucet holes and overflow, making DIY installation effortless. Sinkology artfully handcrafts each sink from pure solid copper. Sinkology Naked copper sinks are natural and pure, designed to age gracefully and can be easily be brought back to new with a little polish. Hubble 14-inch x 5-inch x 14-inch Circular Copper Bathroom Sink with Drain in Bronze This sink from Sinkology adds a nice touch of elegance to any bathroom. Manufactured using high quality copper, it can withstand all kinds of everyday wear without losing its stylish appearance. When it comes to improving the overall look and utility of your bathroom, this sink is a top-grade choice. 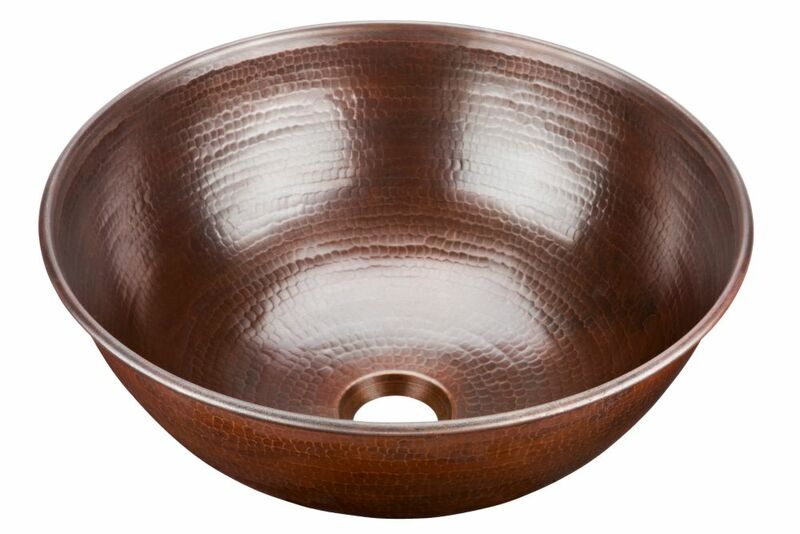 Hubble 14-inch x 5-inch x 14-inch Circular Copper Bathroom Sink with Drain in Bronze is rated 4.9 out of 5 by 25. Rated 5 out of 5 by Daryl from It was very well made and assembled easily once I... It was very well made and assembled easily once I figured it out. The only problem was the instructions were vague and there were extra parts for different installations but It is a very nice sink. I am very satisfied by the looks, quality, and the price. Rated 5 out of 5 by Cork from Looks awesome! I bought this a month ago and it looks amazing all put together in my bathroom ! It did not take long to get it after I ordered it... I was impressed ! Rated 5 out of 5 by Emeryt from Love these sinks! Exactly what we were looking for.... Love these sinks! Exactly what we were looking for. Rated 5 out of 5 by Tara from Beautiful sink. Absolutely stunning. Very happy with this purchase. Rated 5 out of 5 by Shamrock from Love this sink! Beautiful and great value!... Love this sink! Beautiful and great value!